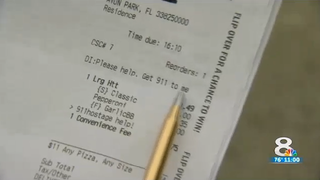 A woman in Florida escaped from being held hostage on Monday thanks to Pizza Hut’s smartphone app, and employees who recognized her order. Ethan Nickerson and his girlfriend had been arguing throughout the day when he started to threaten her with a large knife. Nickerson then took her phone, but later gave it back to her so that she could order a pizza. She slipped a message into the comments section reading, “911hostage help!” and “Please help. Get 911 to me.” Nickerson immediately took the phone back after the order. Thankfully, the woman was a frequent customer and the employees recognized that it probably wasn’t a hoax. They immediately called the police, who arrived to find the woman and one of her children answering the door. The two other children in the home were released by Nickerson after 20 minutes of talking with police through a closed door. All of the victims are reportedly safe, and Nickerson has been charged with intent to kill, battery, false imprisonment and obstructing justice. The police told WFLA that he may have been high on meth at the time.